Slightly bend the three points of the cage and wire them together. Glue the 4″ ball onto the points of the cage. Cut 4 pieces of white/ivory paper 13″ long. Untwist and glue pieces together lengthwise. Cover the styrofoam ball and wire tightly at neck. 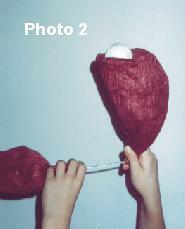 Glue the 2″ balls to each end of the 18″ piece of hard wire. Cut 4 pieces of the white/ivory 7″ long. Untwist and glue 2 pieces together lengthwise. Cover the ball of one hand and wire at wrist. Repeat with the other hand. Cut 8 pieces 12″ long using the colored paper. 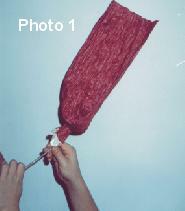 Untwist and glue 4 pieces together lengthwise. Folding both ends towards the middle, glue together so the 4 pieces now form a tube. Slip the sleeve over one of the ball hands just to wrist. Wire very tightly. (see photo #1). Repeat for other sleeve. Push the hand through the tube. 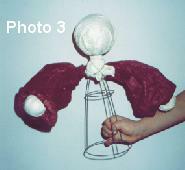 Push the hand through the tube, turning the sleeves right side out. (see photo #2). Wire the arms the tomato cage. (see photo #3). Cut 16 pieces of colored paper twist 14″ long. Untwist and glue pieces together all the way around, forming large tube. Cut a slit 5″ long at each side (for arms). (see photo $4). Slide the dress onto the cage, lining up the slits under under each arm. Gather paper at the neck and wire. 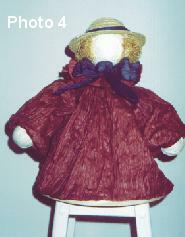 Ruffles may be pushed down to form a collar. Add a bow to collar. Add hair and hat as desired. In addition to our standard 4″ width we now offer our paper twist in 6″, 8″ and 10″ widths. These widths are available in the new 6 Yard and 25 Yard Hanks. When using on of the wider widths, please alter materials needed accordingly.